Martinborough’s about an hours drive North of Wellington. I first went there in the early 90s, it’s become one of my favourite areas for Pinot Noir. New Zealand Wine, Hall of Fame. Larry McKenna’s wine impressed me from day one. Larry has been referred to by various wine writers and authorities as everything from the ‘Prince of Pinot’ to the ‘Godfather of Pinot Noir’. 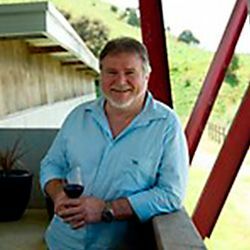 When he was inducted into the New Zealand Wine Hall of Fame in 2014, he was acknowledged as the winemaker who introduced New Zealand to quality Pinot Noir. In doing so, this helped Martinborough become known as Pinot Noir country. Wine Spectator magazine has published its list of ‘Top 100 Wines’ every year since 1988. Its influence is substantial. 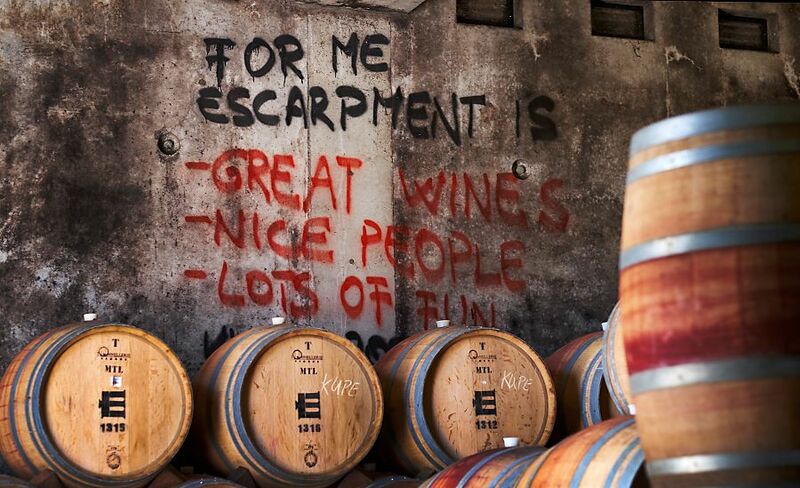 Recently the Escarpment 2013 ‘Kupe’ was awarded number seven spot in the top 100 – the only wine from these parts to make the top ten in 2015. 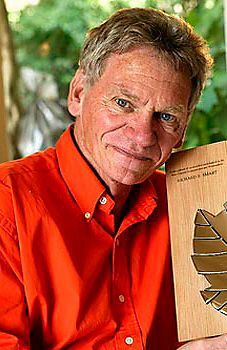 I was in Martinborough recently and caught up with Larry. What’s so special about Pinot Noir ? Cos I love it ! When I arrived in New Zealand in 1980 I was less than impressed with the Cabernet based wines produced here and particularly that from around Auckland. 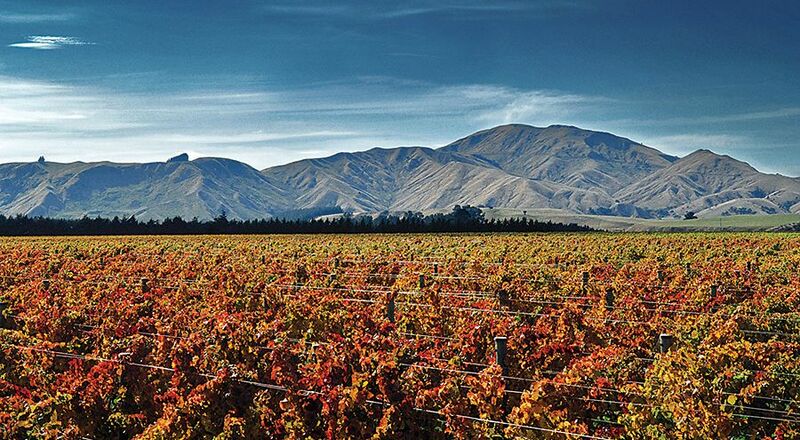 I moved to Martinborough in 1986, with the express intent of being involved with Pinot Noir. 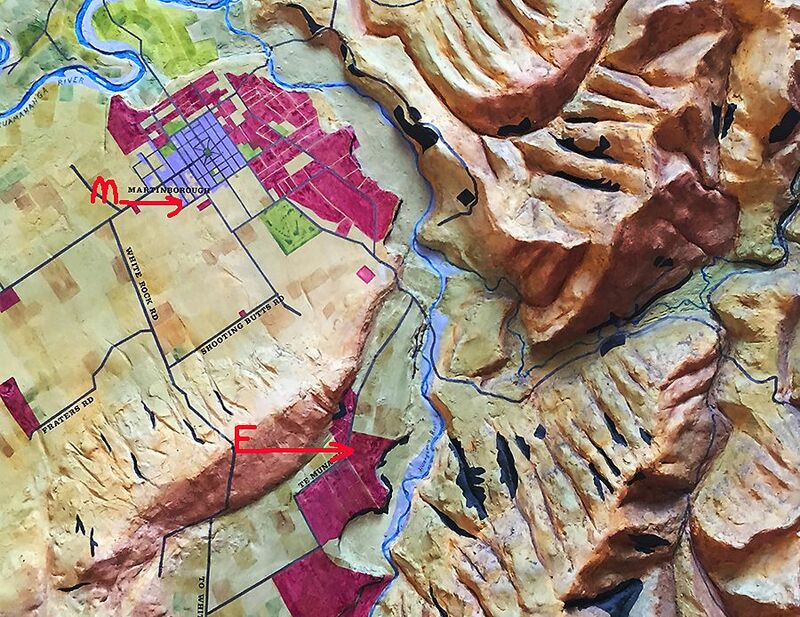 Relief map in the Martinborough Wine Merchants show the local terrain. Escarpment is marked (bottom middle) about a 10 minute drive out of the town : Photo © Milton Wordley. I really thought that variety suited this climate so much better than the Bordeaux varieties. On top of that I just enjoy drinking Pinot Noir much more than any other red. It suits modern cuisine perfectly. Was much Pinot planted in Martinborough in the early 1980s ? Not much, it was just about a brand new variety back then. There were really only three labels, Ata Rangi, Dry River and Martinborough Vineyard. I joined Martinborough Vineyard in 1986. At the time I was the first professional winemaker in the district. 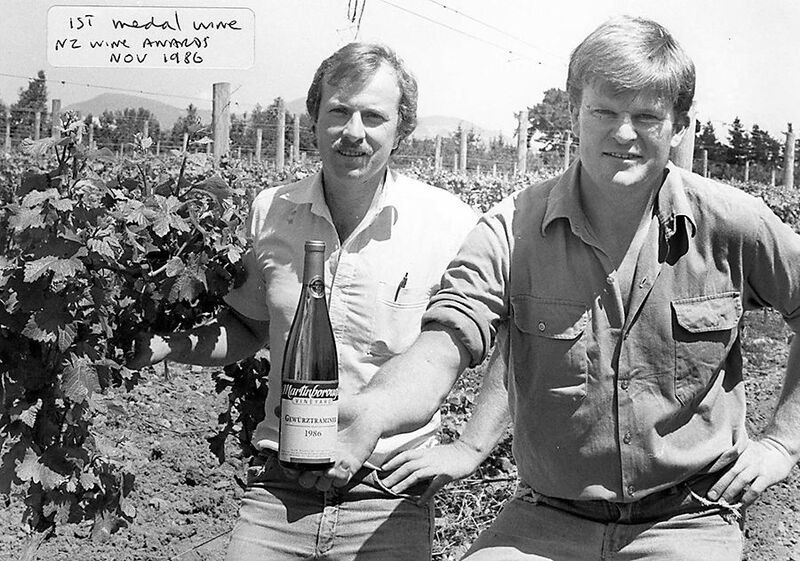 First medal for Martinborough Vineyard, a 1986 Gewürztraminer. 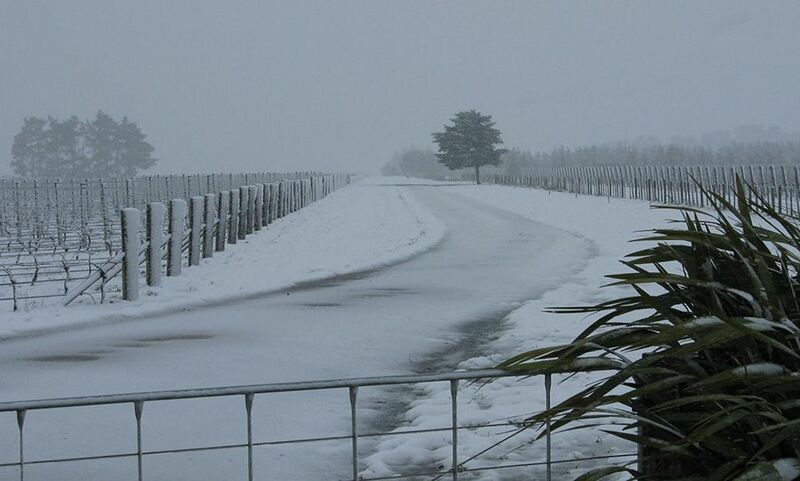 Larry and Duncan Mine, MD Martinborough Vineyard : Photo Supplied. We all worked together, there was a friendly rivalry, but we all helped each other – still do, it’s one of the things I love about the wine industry. We didn’t make wine together as such, but we certainly collaborated – there was such a void of knowledge back then. We did a lot of tastings together, often as monthly get togethers. Stan Chifney built the first winery. The first production in the area was in 1984 – It was very small and very hands on, everyone had limited knowledge, they were all amateurs really. Dr Neil McCallum at Dry River was a scientist – Clive Paton at Ata Rangi was an ex dairy farmer so he could understand growing things and Martinborough Vineyard was started by another Department of Scientific and Industrial Research soil scientist Derek Milne and a group of investors. He really understood soil science and agronomy and he knew this district very well, having done his PhD on the soils of the Wairarapa. He championed Pinot here from the word go – so he was really responsible for getting Martinborough happening. What was your early life like and how did you get into the winemaking ? I was brought up in Adelaide on a diet of Mclaren Vale Shiraz and Cabernet Shiraz. At family occasions we had fantastic meals prepared by my mother and wine from my father’s cellar. He wouldn’t have a bar of the Barossa Valley; he just loved Mclaren Vale so that was the red wine in our house. Table wine as part of everyday life was all a bit unusual in the 1960s. I went to Roseworthy, studied agriculture rather than winemaking. A lot of our horticultural examples were vines so we learnt a lot about viticulture. But my first love was making wine, so I went into the industry as a winemaker. It’s been great. Escarpment Vineyard was established in 1998. What’s the back label to it’s creation ? Escarpment Vineyards entry : Photo © Mike Haydon. Martinborough Vineyard wines was going through some changes that I didn’t fully agree with. At the time I was consulting to a new project – ‘Yabby Lake’ in Victoria with Robert and Mem Kirby (owners of Australia’s Village Roadshow Group) in collaboration with Dr Richard Smart the viticultural consultant. In 1998 Robert Kirby, in his wisdom, offered me a joint venture partnership to create my own label here in Martinborough. It was something I had wanted to do for a while, all I needed was a financial backer. We bought this property ‘The Escarpment’ on Te Muna Road in late 1998 and started planting in 1999. 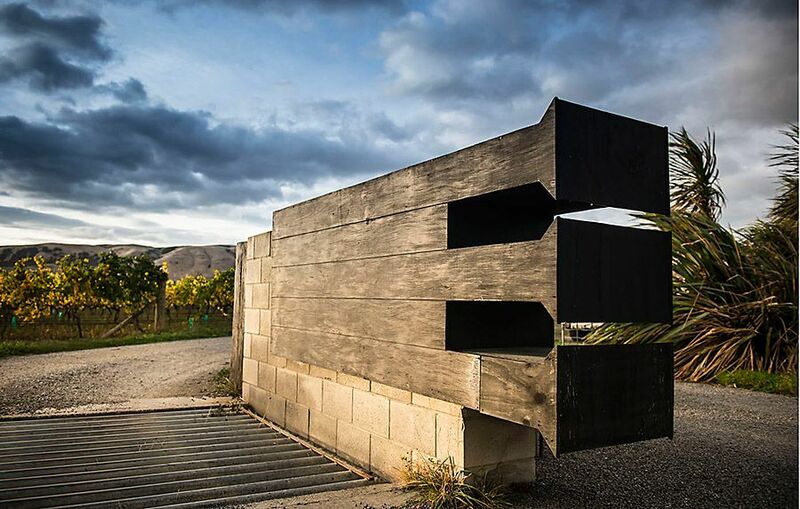 Escarpment Vineyard Te Muna Road Martinborough : Photo © Mike Haydon. How did you pick the site for Escarpment’s vineyards. I was looking everywhere at the time and I had my eye on a number of properties. This land was available, it was the right size and most importantly it forms part of the Martinborough Terraces. The alluvial gravel terrace, it’s the soil type that we most prize in this district. View of the vines to the left on top of the escarpment and then looking north from the same spot down the escarpment : Photo © Milton Wordley. It has been laid down by the Huangarua River to the north side of Martinborough and the Ruamahanga River to the West. The alluvial gravel terrace plantings started off very close to Martinborough of course but now extends to the east and south east of Martinborough. 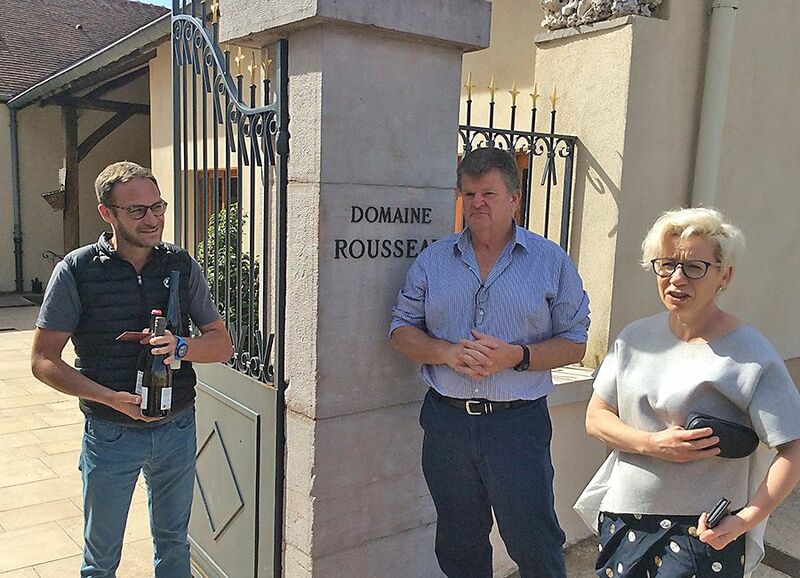 Larry with Frederic Robert Domaine Rousseau and Helen Masters, Ata Rangi in August 2015 doing a quick wine swap : Photo Supplied. It’s the same river terrace – same soil type and essentially the same climate … perhaps slightly cooler here and we pick marginally later depending on the clone root stock – but I really wanted some of this alluvial gravel terrace. It was part of my progression from central Martinborough. I’d learnt a lot about growing Pinot in this district from 1986. To advance my knowledge of Pinot Noir I’d been to Burgundy a number of times. The one thing I saw there, that we weren’t looking at in Martinborough, was high density planting. So that was a concept from the ground up here at Escarpment, when we planted that is what I wanted and that’s what we did. It wasn’t really changing soil type or district or climate. We simply changed some viticultural parameters. Your single Vineyard wine the 2013 ‘Kupe’ has just been announced as #7 in the Wine Spectator Top 100. How does it feel ? Fantastic, of course. It’s totally deserved for NZ Pinot Noir. I’m very grateful Escarpment Kupe has been chosen to carry the banner. It’s somewhat ‘a coming of age for NZ Pinot noir’. Kupe 2013, Number Seven in the Top 100. We are all very quick to take a shot at Wine Spectator but when you are on the receiving end it’s all very exciting I can assure you ! 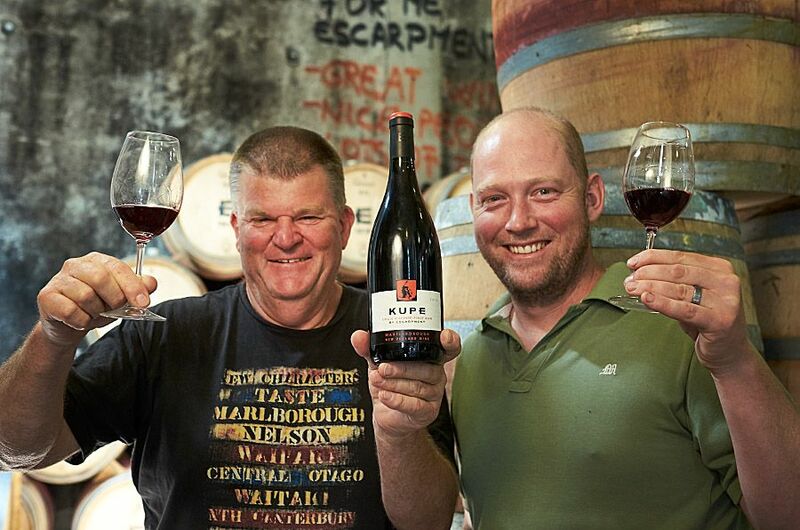 Larry and Huw Kinch the full time winemaker with the 2013 Kupe : Photo © Milton Wordley. How old is the Kupe vineyard ? We planted in 1999, so it is 17 years old. We first picked in 2003 and were very happy with the result right off the bat. We knew we had picked something quite unique to this district. 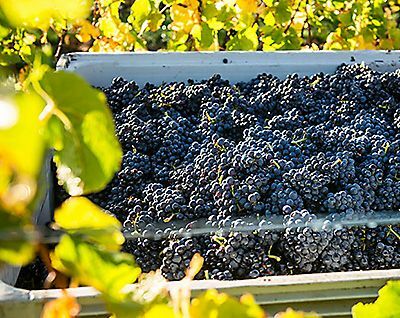 The pickers who had been picking all season and really are people who enjoy viticulture but perhaps didn’t fully understand the intricacies of wine, all came out of that block that day and said “well that’s totally different’. 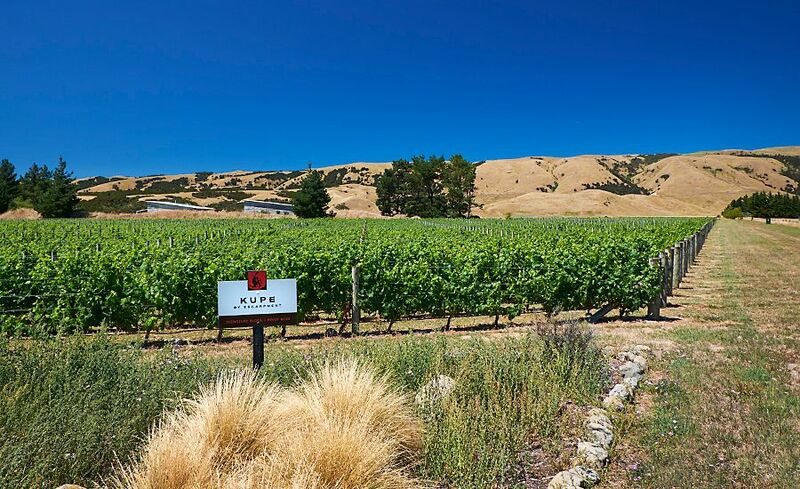 The Kupe vineyard : Photo © Milton Wordley. We decided that once the wine was made, it was unique enough to put it out under its own label and that was the beginnings of our single vineyard range. We made that wine since 2003 and its been very very successful for us. The fruit has changed as the vines have aged. The first 10 vintages were a bit variable. Snow on 15th August 2011. Photo by Dave Shepherd. We had a couple of very radical seasons in that decade, but even when we thought we had an ordinary season we still got a surprise about the fruit characters. Nowadays we just don’t see the variations. We’ve had very consistent vintages since 2013. The 13, 14 and 15 have been more consistent and have been exactly what we’d expected. Kupe is named after the great Polynesian voyager Kupe, what’s the story ? The statue of Kupe on the Wellington waterfront. In Maori mythology Kupe was involved in the Polynesian discovery of New Zealand in the tenth century. Kupe was a great chief of Hawaii who arrived in New Zealand in 925 AD in double hulled wooden canoes. The skyline behind the vineyard is known locally as the Ngawaka a Kupe or the three canoes of Kupe. 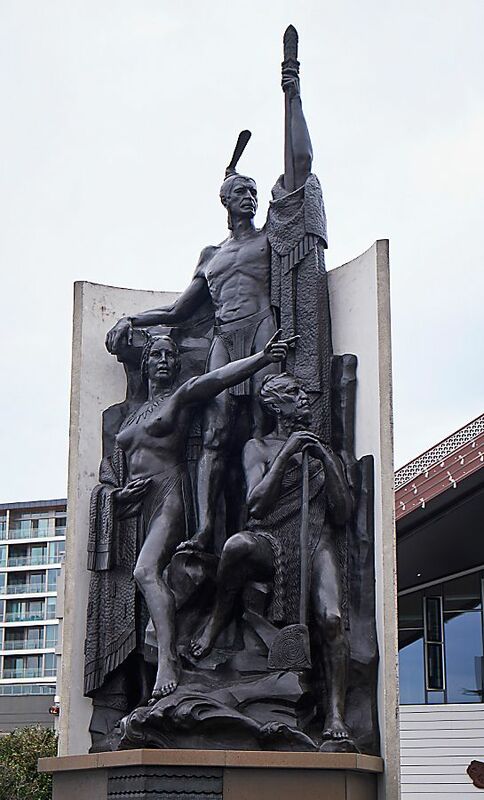 There is a statue of Kupe standing on the Wellington waterfront. The important thing from our point of view is that it relates us to our place. When we decided to call our top wine Kupe, we asked the local elders of this region and the people who looked after the statue in Wellington. They were all fine with it. I think it’s a fantastic name, there would be a lot of people who would have loved to have thought of it first – but I love the name. I love the brand and I love the story. You have helped put New Zealand wines on the international map and collaborated with many. Any stories ? Firstly let’s start with Dr Richard Smart. Richard was here as government viticulturist for 10 years from the mid 80s. We don’t really have that position anymore. He’s a fantastic educator, fantastic speaker – very passionate about viticulture of course. He taught this industry about canopy management, yield prediction, yield thinning and creating great fruit for wine on the vines. We really didn’t have a full understanding of the vine prior to that and I credit him with total transformation of viticulture in that period. Pinot Noir workshops around the world have helped as well, especially the annual Oregon event. There’s plenty of collaboration within the International Pinot community. I was the first person from here to be invited to Oregon. In fact I believe the invitation was extended to me in the hope that I would bring the idea of the event back here and create the same event or as it’s now known, the Southern Pinot Noir Workshop. Only producers can attend, everyone brings their wine along in a paper bag. Blind tastings are held and everyone critiques each others wines. It’s a great learning experience. Vintage time, Escarpment Vineyard : Photo © Mike Haydon. We’re not certified, we’d love to be – we’ve put a lot of effort into it over a reasonable period of time. We’ve still got just one thing that we haven’t got on top of – and that’s weeds. Its difficult in this climate. The spring season is a very conducive to grass growth and weeds. We still need to use Roundup and that has to change. We’re going through a really good learning curve this year about how to do it and i think we’re on to it. The machinery has developed to the point of being able to do it. We weren’t comfortable with just mowing under vines and didn’t think that was the answer. We can grow fruit here organically and we’ve done that without Roundup since we started the new approach this year. When we have run this weed program for another two years we will go after all the certification. But its more about being responsible to the land and grapes therefore the wine. 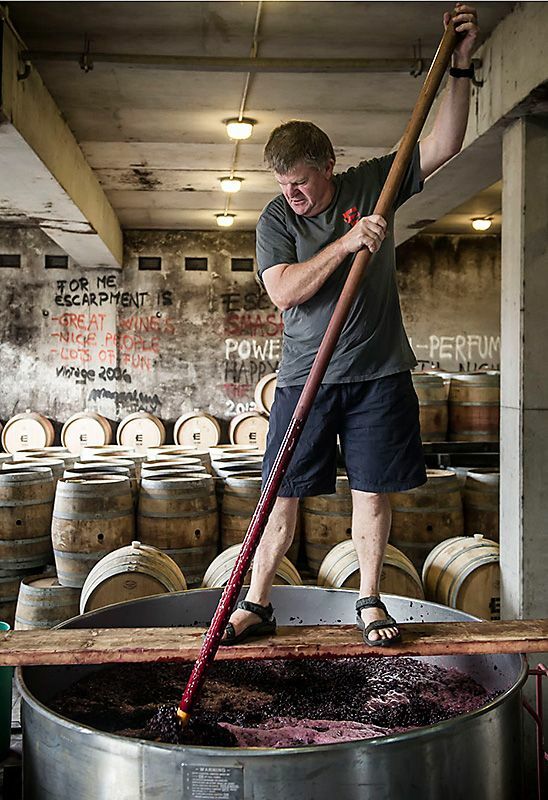 Winemaker or businessman, or both. How do you find it ? Vintage, Larry in the cellar : Photo © Mike Haydon. Thats’ a good question. As I mentioned earlier, I went to Roseworthy and studied agriculture, but my first love was making wine, so I went into the industry as a winemaker. 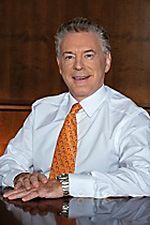 Becoming a 50% investor or shareholder in our own business meant that someone had to run it. It’s growing all the time, so that someone is me. We now employ Huw Kinch as a full time winemaker. He’s sort of grown up with us, we work together and he is doing a fantastic job. Normally shareholders want a return. I’d have to say that Robert Kirby has been very generous in his support of this business, he hasn’t demanded anything that we cant deliver. We’ll get there one day. If we were relying on a bank as a shareholder, we would no longer be here. Robert has supported us, he has a great love of wine. He’ll be in New York for the Wine Spectator presentation with us. I have always said right from the word go, most of us understand the growing and the making of wine pretty well; but it is the marketing and the selling that’s the clever part. The people who are good at that are likely to survive. It is also fair to say, the majority of wineries in NZ and probably in Australia as well, are most likely struggling financially. Because they’re simply not big enough. They are often operated by people with a passion for wine, but who need to have two jobs to support the passion. When you are small you have to wear many hats – too many bloody hats. Obviously a good place to work. Cellar signage by a vintage worker : Photo © Milton Wordley. Anyone in particular that has influenced you ? I have already mentioned Dr Richard Smart. 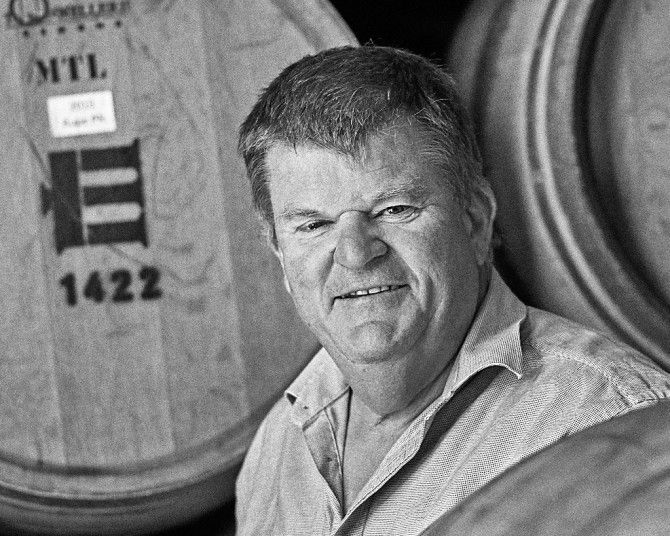 John Hancock, Trinity Hill wines : Photo Supplied by Trinty Hill. John Hancock, another South Australian who I actually went to school with is another. He had the job at Delegat and I took over from him. He then went to Morton Estate. Because I’d done agriculture and not a winemaking degree he was a mentor to me in the early days. He did that very happily and we are still great mates. He is now at Trinity Hill in Hawkes Bay and making some very good wine there. I always say Hancock has got a lot to answer for. He is one of the main reasons I am here. Since my fascination with Pinot, Gary Farr has been a great collaborator. We usually share parts of our vintage and have become great friends. As with Hancock he has plenty of questions to answer and most importantly makes a great risotto and looks after all the cigar smoking late at night. Favourite wine style for a Last Supper ? It’s got to be Chardonnay and Pinot. Given a choice the best Burgundies, red and white will do me any day. Seafood, anything out of the sea really especially crayfish. We also have a lot of fun out here with wild Mallard duck and hare from the vineyard. Crayfish and Chardonnay or wild duck (or hare loin) and Pinot,it doesn’t get much better than that ! Cycling I suppose is one – just being outdoors really. Cycling, fishing, sailing, anything outdoors. This is a great region for an adventure. I just love an adventure ! 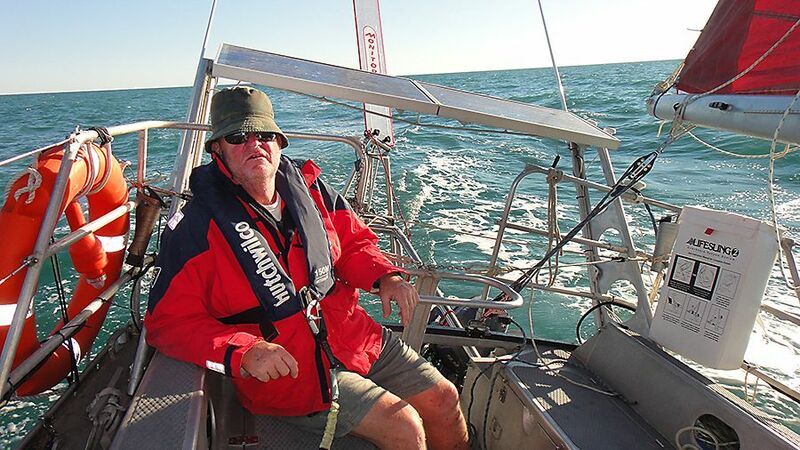 Larry off the coast of The Kimberly, Northern Western Australia : Photo Supplied. Anything else you want to add ? From the marketing end there is one other person who has been instrumental in NZ’s success with Pinot in Aussie and another Adelaide connection. 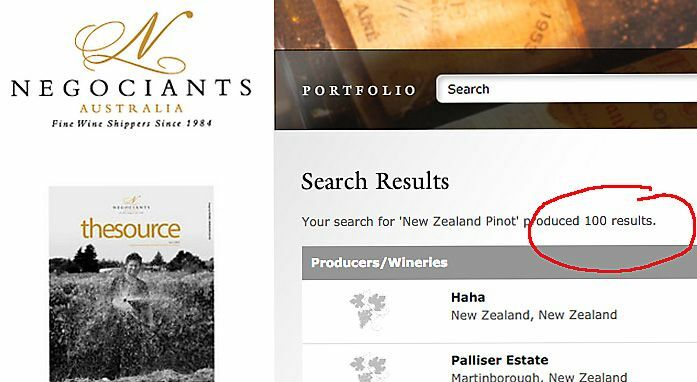 A search for NZ Pinot on the Negociants sites brings up 100 results. Pete James came to NZ in the early 90’s (back in his Negociant days) and identified the best Pinot Noir producers for that portfolio. Essentially overnight, he increased the price of Australasian Pinot by about $10 a bottle with this range of wines. None of us were exporting to Aussie at the time so it was a huge leap of faith with a wine style which was still essentially under rated and misunderstood by the red wine drinking public. Many of these producers are still with Negociants today. Can I also say having been brought up within a stones through of the Penfold’s Magill Cellars and having never visited. I think next time I’m back in Adelaide for a long overdue catch up, a long lunch at the restaurant with a few of the guys is very much in order. Penfolds Magill Estate Restaurant : Photo supplied.